This software identifies the characters of the text with great precision. The quality of the converted file is fascinating to view. 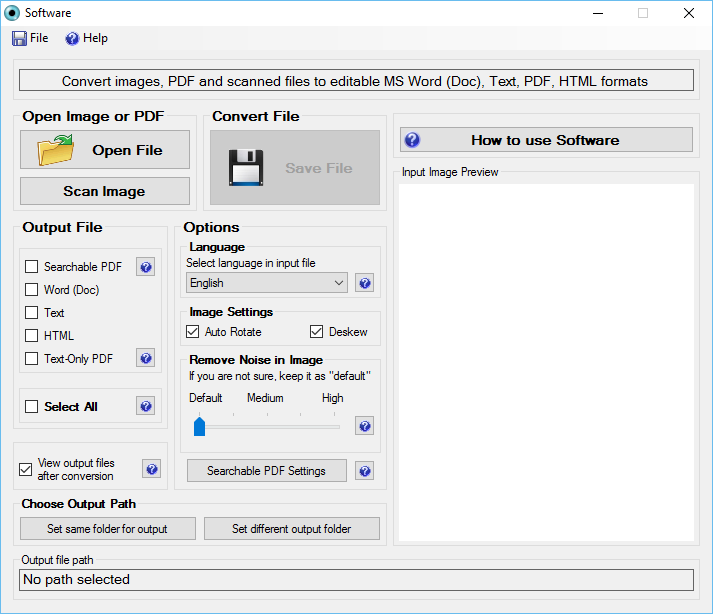 JPG to Word Converter also supports the various file formats such as JPG, TIF, PDF, JPEG, GIF, and BMP. You can digitize your image file in any format respectively. This software supports more than 40 foreign languages. This feature gives you the opportunity being connected the clients around the world. You can easily digitize your image file in any language as it recognizes the stored characters very well Now, the language barrier is no longer a problem. You also get the feature of high-level security by maintaining the CIA (Confidentiality, Integrity, and Availability) service. Your document cannot be edited or copied from the illegal source as you will provide watermark and password protection for the safety of your file. JPG to Word Converter can convert your image file or document to either a PDF document, text, HTML file or Word document. This software helps to reduce the amount of work as it does the job of converting the multiple files in no minutes which used to take the hours. All the features of JPG to Word Converter are incredible because probably you will not get them at one platform only.